Originally a sentient device invented by Kem-L, a kryptonian ancestor of Superman. The Eradicator was designed as a weapon against the Cleric, and as a device that ensured the genetic purity of kryptonians. It had many powers, one being able to alter the genetic makeup of all kryptonians so that they would be unable to live anywhere besides Krypton. Because of this introduced genetic flaw, the kryptonians who left with the Cleric all died. Also this meant no kryptonians could escape when Jor-El discovered Krypton's imminent doom. The Cleric gained control of the Eradicator and years later gave the artifact to Superman, who used it to teleport home from outer space. Superman, however, found the Eradicator's powers many and uncontrollable. One incident caused Jimmy Olsen to temporarily gain painful powers of elasticity. Deciding the Eradicator was too dangerous, Superman buried it in the Antarctic. Buried, the Eradicator secretly created a kryptonian Fortress and attempted to transform the Earth and alter Superman's mind to "transform" him into a kryptonian. When Superman discovered its' efforts he underwent the Kryptonian rite of passage and apparently had control of the Eradicator. However, the Eradicator continued to mentally attack Clark Kent, who only with the help of his adoptive parents defeated the device in the Antarctic, and Superman left the Eradicator in the sun apparently destroyed. Later, the Eradicator returned in a humanoid form again trying to convert Earth and Superman, before being apparently destroyed within the Fortress by Superman, helped by Prof. Hamilton. After Superman's apparent death, a being appeared known as the Last Son of Krypton. This being was revealed to be the Eradicator. The Eradicator's dissipated energies had reformed in the Fortress and when finding Superman dead, used his body's solar energies to convert mass from Superman's tomb into a body for the Eradicator. Then, the Eradicator had taken Superman's body to the Fortress of Solitude where the body slowly revived within an energy matrix. After Superman revived, he with the Eradicator and other heroes fought the Cyborg Superman. When the Cyborg Superman tried to use kryptonite energy to destroy Superman the Eradicator released its' energy to restore Superman. The body of the Eradicator was taken to Metropolis' S.T.A.R. Labs where a dying scientist (Dr. David Connor)'s experiments caused his mind to transfer into the Eradicator's body. This new Eradicator has worked with the heroes known as the Outsiders. However when the Fortress of Solitude was destroyed in the wake of Superman's attempt to rule the world (Superman: King of the World) a duplicate Eradicator program tried to re-assert its will on the Eradicator, driving him to an attack on Stryker's Island (MOS #97) before the Eradicator managed to gain control of himself once more (thanks to Superman and Steel) and decided to exile himself in space to prevent harming anyone and to move out of the duplicate program's influence. However when Brainiac 13 started causing havoc in Metropolis on New Year's Eve 2000, the Eradicator returned to help Superman. Together they raced to the ruins of the Fortress of Solitude to stop the duplicate Eradicator program from joining with the B13 technology. The Eradicator merged with the Eradicator program and shot himself into deep space, away from earth (MOS #98). Months later the Eradicator returned to earth to warn Superman about the approach of Imperiex, however rash moves by Professor Hamilton saw the Eradicator angered into taking matters into his own hands. Superman use the Theta state which keeps the Eradicator distracted with a giant projection, Superman flies into the Eradicator's body and uses their psychic link to flood the Eradicator with images from the other (new) Krypton. Unable to comprehend the thoughts assaulting his mind, the Eradicator begins to break up, separating the bulk of the remains of the Fortress from the body of David Connor. Gathering up the wreckage, Superman and S.T.R.I.P.E. return to the Steelworks where they employ the absolute zero chamber to freeze him (MOS #114). He was later released, reveling in battle and attacking Majestic. After several battles, Eradicator came to trust Majestic, and aided him in repelling Daemonites. When the arctic Fortress of Solitude was destroyed, the Eradicator unwittingly became trapped within the rubble, finally being released thanks to John Henry Irons. 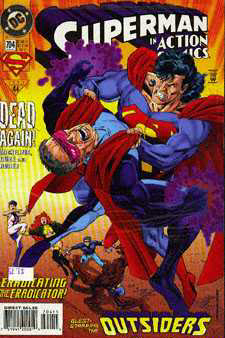 Confused and angered, the Eradicator attacked both Superboy and Superman, before being knocked out by an OMAC unit. The Eradicator remains a strange and uneasy ally to the Man of Steel.